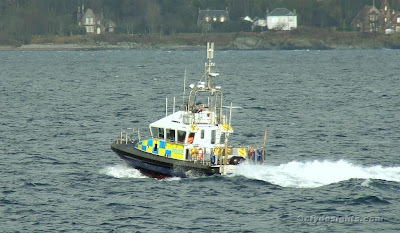 The Ministry of Defence Police launch GIGHA has completed her trial period with the Clyde Naval Base and is now serving as a fulltime unit. An order for a further five similar launches has been placed with Holyhead Marine. Subject to suitable funding being made available, it is hoped that there will be fifteen such boats within five years. GIGHA, which is 14.90 metres long, is driven by two Caterpillar engines and twin Rolls Royce Kamewa waterjets, which give her a speed of up to 33 knots.